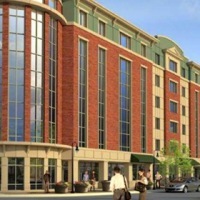 ARRIS Engineering is in design of a 28,260 sf residence hall at Bloomfield College in Bloomfield, New Jersey. The four story building is seeking LEED Silver Certification. The space will house retail on the first floor and a 234 bed dormitory on floors two through four. The new dormitory will act as a campus center and become the central focal point for the Bloomfield Campus.